Despite claims that raising corporate taxes will lead to “capital flight,” Corporate Canada has managed to smash its old record, sending close to $200 billion to tax havens – even as Canadian corporations enjoy their lowest tax rates in recent history (and among the lowest in the world) thanks to Stephen Harper’s Conservatives. New data from Statistics Canada show the amount of money flowing from Corporate Canada into the world’s top 10 tax havenshit a record $199 billion last year. And if that doesn’t surprise you, get this: the second biggest destination for money flowing out of Canada is now Barbados. 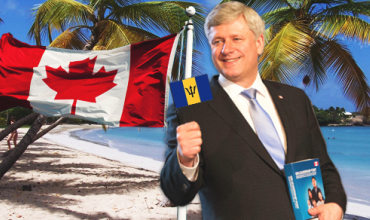 “Walk down a street in Cayman Islands and you will see very little evidence of $36 billion in Canadian investment. But what you will see are small buildings with hundreds of mail boxes that are head office to more than 18,000 shell companies – most of them subsidiaries of corporations trying to avoid tax,” Howlett adds. But that claim is difficult to square with Conservative cuts to Canada Revenue Agency, including $250 million in cuts and 300 jobs eliminated in the CRA division responsible for investigating offshore tax dodgers. Internal records show the Conservatives are folding their international tax evasion units and cutting 50 “highly-trained” senior managers. But it’s not clear the Conservatives take the issue very seriously. But who knows – maybe it’s all just a neat coincidence money was shifted out of Luxembourg after the offshore tax data was leaked? 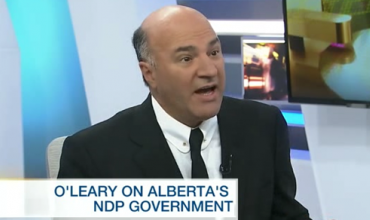 What does Kevin O’Leary think about Alberta’s newly elected progressive NDP government?